CHECK OUT THIS OPPORTUNITY! 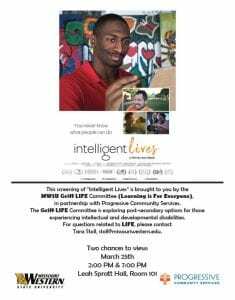 Missouri Western State University’s Griff LIFE (Learning is For Everyone) Committee and PCS will present 2 showings of the film “Intelligent Lives” at 2 & 7 pm, Monday, March 25 in the Kemper Recital Hall, Spratt Hall room 101. The screenings are free and open to the public.The Griff LIFE Comm. is exploring post-secondary options for those experiencing intellectual and developmental disabilities. For more information about Griff LIFE or the screenings, please contact Tara Stoll, stoll@missouriwestern.edu.